KOUROU, French Guiana — Arianespace announced the delay of a dual satellite payload on Tuesday, April 14. The launch, designated VA222, was scheduled to liftoff from Kourou, French Guiana, on Wednesday, April 15, and is the first Ariane 5 launch of the year. The vehicle will carry two European communications satellites – THOR 7 and SICRAL 2 – to space, and both are reported to be safe in standby mode until a new launch date is set. 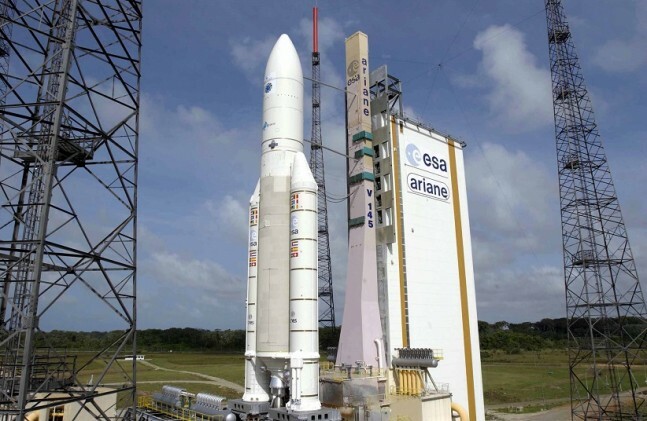 Arianespace expects to announce a new launch date soon. THOR 7 is constructed by Space Systems/Loral in California and is designed to beam television programming across Central and Eastern Europe via a Ku-band system while also providing high powered coverage over the North Sea, the Norwegian Sea, the Red Sea, the Baltic Sea, and the Mediterranean via a Ka-band system. SICRAL 2 is designed by Thales Alenia Space, and will be responsible for providing communication services to French and Italian armed forces, as well as other NATO member nations over a 15-year period. Operating in the UHF and SHF bands, SICRAL 2 will enhance the communications services currently provided by SICRAL 1 and SICRAL 1B and by France’s Syracuse System.